How much would you pay to have breakfast with Tiffany actress, Nichelle Nichols? One of the many highlights of the Shades of Blue Gala in Denver on Saturday was a live auction where bitters fought for the right to break bread with a living legend! It finally came down to two contenders in a battle royale—both determined to spend as much as $2,000 to best the other. In a surprise move, the clever auctioneer doubled down on the combatants allowing both the opportunity of victory—with each paying $1750! One of the two victors was Dr. Bernard Harris, the first black man to walk in space. Did I mention that the Gala was a first-ever black astronaut reunion? Of course, by now we should all know that it was Nichelle Nichols who made Bernard Harris’ feat possible; she was the one who broke the ‘color line’ for astronauts. Yes Virginia, there really was a time when there were no minority astronauts (from 1958 to 1983) until Star Trek actress, Nichelle Nichols publicly admonishes NASA for not having minority astronauts and NASA shamefully agreed. In 1977, NASA hires Nichelle to recruit minority astronauts but she had a few conditions: she had to be on her on, she didn’t want NASA handlers and she wanted to be able to recruit anywhere she wanted including inside the military. Almost immediately she is invited to a meeting at the Pentagon where she is told, “The Armed Services are off limits!” Of course, that’s exactly where she goes first! Her first recruits from the military were Guy Bluford and Fred Gregory. She tries to recruit Charles Bolden (the current NASA Administrator) but he has reservations. He finally applies and becomes an astronaut two years later. Not surprisingly, some had applied as military astronauts and were rejected! Nichelle also personally recruits Dr. Ron McNair, Judith Resnik, the first Jewish woman astronaut and Ellison Onizuka, America’s first Asian astronaut. Nichelle’s 1978 recruitment yields ten new astronauts and literally changes the face of NASA! A United Airlines Captain, Willie Daniels had a dream to have as many black astronauts as possible together in one place—something that had never been tried before. On Saturday August 29th, 14 of the 17 surviving black astronauts attend his first-ever black astronaut reunion and Gala in Denver CO sponsored by Daniels’ nonprofit, Shades of Blue making the event an unqualified success. Guy Bluford, Fred Gregory and Cheryl McNair widow of Ron McNair were on hand representing Nichelle’s black recruits. Also present was Ed Dwight, the first black astronaut candidate recruited by President Kennedy, who still waits to be classified as a full-fledged astronaut. Among the brothers who couldn’t make it were three who died in accidents: Robert Lawrence (in a training flight) and Ron McNair and Michael Anderson (in shuttle disasters). NASA administrator, Charles Bolden could not attend but sent his regrets and congratulations via a video presentation. Willie Daniels’ Shades of Blue is a nonprofit dedicated to inspiring young people by teaching them aviation science. Shades and TSM are looking to join forces with TSM adding the space education piece to Shades of Blue’s aviation curriculum. 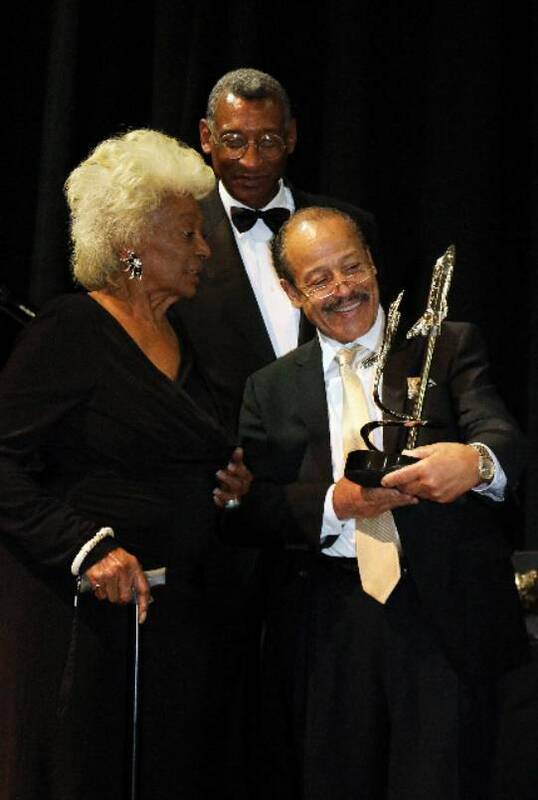 For her success in recruiting for NASA and being an inspiration figure for 50 years, Nichelle Nichols received the magnificent (and very heavy) Ed Dwight Lifetime Achievement Award trophy from Ed Dwight himself. The trophy —an ascending shuttle Orbiter and trailing fighter jet was designed and beautifully sculpted by Ed Dwight, who reinvented himself into one of America’s most renown sculptors. While writing this, Ed sent me the photo of the three of us (above). Besides being my buddy and a personal hero, Ed is also a quite a mensch! Categories: Ivor, Kids Talk Radio, Nichelle Nichols, Space Science | Tags: Occupy Mars | Permalink.